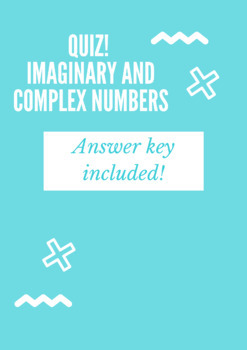 This 20 - 30 minute quiz on imaginary numbers and complex expressions is a perfect assessment for your Algebra 2 or Pre-Calc class! The quiz covers simplifying the imaginary unit raised to different powers, operations with complex numbers, and comparing algebraic expressions to complex expressions. The answer key and scoring suggestion are included.